Titanic‘s, “Plymouth Harbour“, after the renowned Norman Wilkinson. This painting is one of two. What makes this painting very special? For one thing, the connection with ‘Titanic’, this page goes into considerable detail about the painting, explore, profit, enjoy. To this painting I bring a combination of skills no other artist can offer. These include, I’m very familiar with Wilkinson’s work having seem many of the originals in London. I’ve lived at Plymouth and sailed the waters for over 25 years including winning to many races to remember so know the colours, weather, currents, history, intimately. In fact it’s unlikely any other artist knows Plymouth harbour better so I’m the most likely to get right the weather and colouring of Wilkinson’s original painting lost when Titanic sank. To that we can add, I have trained understanding of how photography and photocopies distort colour and there are my alleged painting skills which if you’ve not seen my originals, you can at least have an introduction via my two web sites. The original was lost with Titanic. Rising to a challenge, the story here is of a major painting in progress. 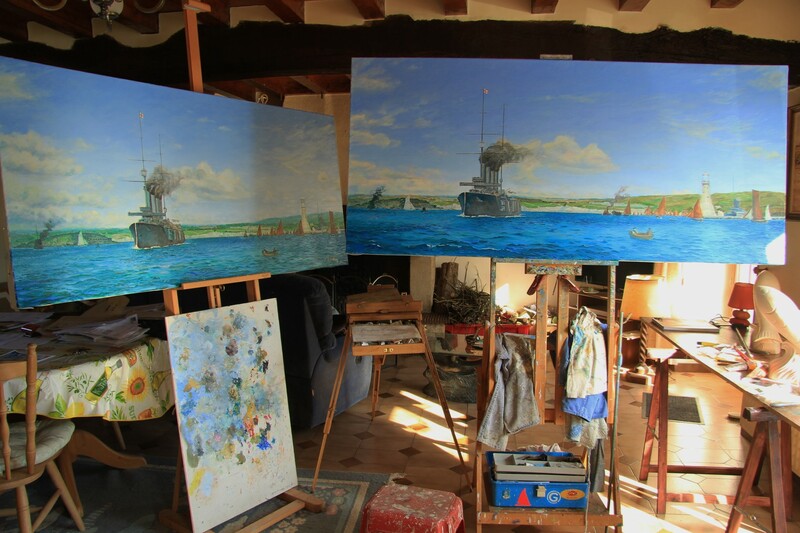 One canvas for my client who is the leading expert on Titanic, the other for sale. I wouldn’t normally copy or reproduce another artist’ work. Why would I want to paint such a well covered story? Why copy when I can make an original of my choosing? However this painting is a real challenge and as you know, Titanic is a ship name just about everyone on the planet knows. I was invited, enticed, I happened to be heading in that general direction anyway, maybe fate lead me to my client’s home. After an amiable dinner and detailed conversation, by 05.00 in the morning and after sharing a bottle of fine vintage port, I’d found a new friend and fellow spirit; I surrendered. My brief is to reproduce as accurately as possible, “down to the last wave top and sea gull“. The painting I am recreating as accurately as possible showed one of the ports of arrival on the Titanic’s schedule. 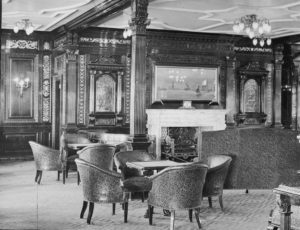 The original by the famous Norman Wilkinson was sited in pride of place in the Titanic’s First Class Smoking Room. All that survives of the original is poor quality photocopy, not even a photograph. Fortunately I am familiar with Wilkinson’s work however that still leaves a detective story for us as I endeavour to unravel from the photocopy, colours and details as faithfully as possible to the original painting. The Wilkinson painting was to be symbolic, emotional, to show a port of arrival at the time of day the ship was scheduled to arrive. Man can overcome nature – his pride is Titanic… and it’s sentimental, too. Sunshine at 2 pm – also showing that Titanic will be as reliable and clockwork and arrive on time. It’s the perfect summer’s day, pre first-world war. Man can overcome nature – his pride is Titanic…and it’s sentimental, too. Wilkinson painted ships from notes and sketches accumulated from all areas. 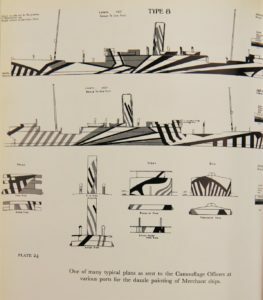 It is almost certainly no particular ship at all – but is supposed to represent the latest class of battleship and the pride of British technology and sea power. They are is an emblems. 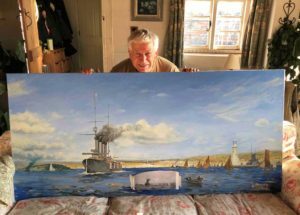 We think his style at this time was somewhat impressionistic – with a touch of fauvism in the sea! It is certainly a colour dependant painting. 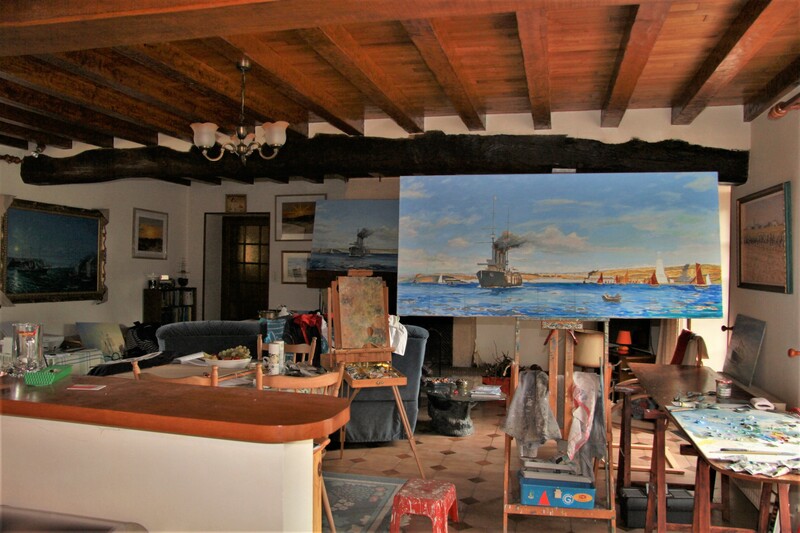 Of some of the details, my client wrote, think the ship behind the wall may be a dreadnought – it looks very wide? Only one black and white photograph of the painting survived until a descendant of Norman Wilkinson generously loaned it the makers of the last Titanic film. What we do have is a photocopy. Given there is nothing reliable to copy some ‘detective’ work, careful research, is needed. This painting will not be a copy of the original by Norman Wilkinson, that is an impossible +. It is though intended to represent our best researched, representation, right down to the last wave top and seagull. I will copy Norman Wilkinson’s signature. The soul oddity will be my own signature will be included. Both her sister ships carried similar themed paintings, same artist, one of which survives to this day. *My client, author of 3 recent books on Titanic, is THE leading authority on this subject. 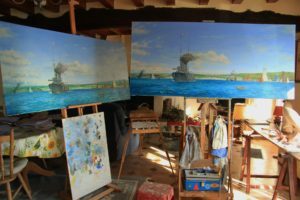 *Many years of my long training in England and France, specialising as a marine and landscape painter. *Familiarity with the work of the famous Norman Wilkinson RNR. *An intimate knowledge of Plymouth Harbour, it’s weather, shipping movements, history and its currents based on over 25 years of sailing those waters including winning numerous races. *Knowledge of the history of Art including materials used during various ages. 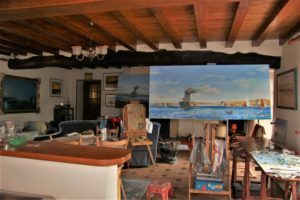 * We have the exact dimensions, the artist’s style at that period in his life; I have identified the type of canvas and paint he used and I have found a source of supply. *My client flatters me by considering i’m the best marine artist alive today. Of course there is no ‘best’, still, such sincere flattery is good for my morale ! 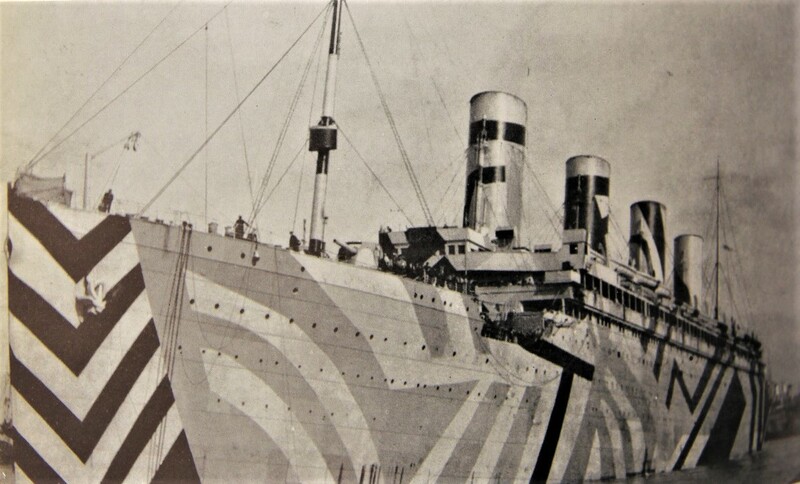 ‘Dazzle’ camouflage was developed and designed by our friend the marine artist Norman Wilkinson. 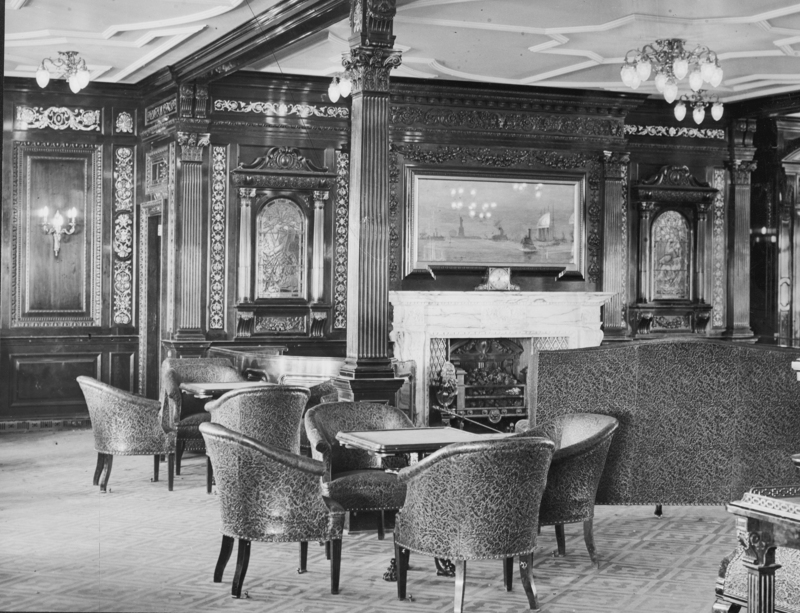 Olympic, one of the sister ships of Titanic. 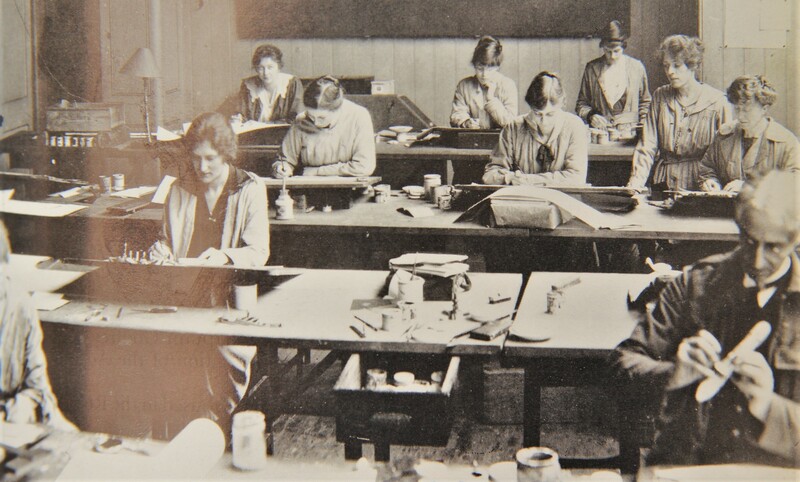 There is a brief introduction to this subject on my blog ‘Dazzle?‘. 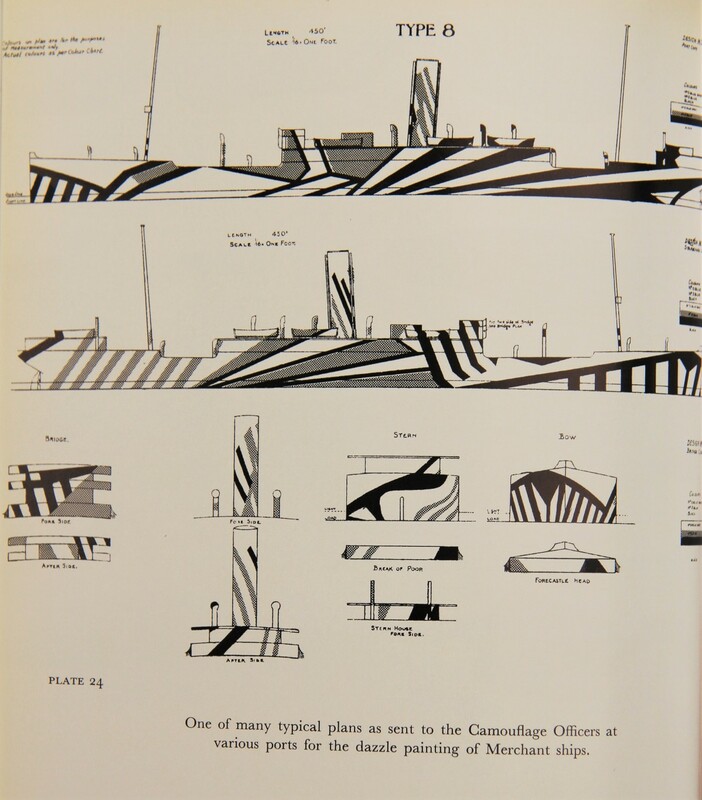 Work which included ‘inventing’ and developing Dazzle Camouflage for the Royal Navy, later gifted at their request to the French, Italians and USN. Meanwhile, if you think I can help you in any way don’t hesitate to ask. Here with Titanic, Plymouth Harbour, progress as of 03.02.2019 you can see the sea is changing, most of the under painting is now in place. 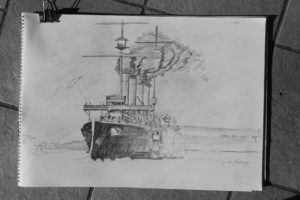 With this painting I am recreating as accurately as possible showed one of the ports of arrival on the Titanic’s schedule. Fortunately I am familiar with Wilkinson’s work however that still leaves a detective story. Once in a life time is enough …? The two Titanic, “Plymouth Harbour” paintings after Norman Wilkinson, very Plymouth. We think he would have used strong somewhat ‘Fauve’ style colours. I play with each painting, trying colour combinations. This technique [schhh, artist secret…] which I’ve occasionally used before, enables me to experiment freely, without concern, with the colours. When one looks best I used the same colours on the other so they will be very similar, “down to the last wave top and seagull” my client demanded. Some one is going to be very lucky.